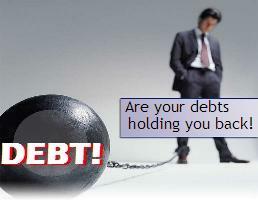 Dealing with credit agencies calling all the time? Are you Overwhelmed by what you owe? You look so stressed; it shows in your face. 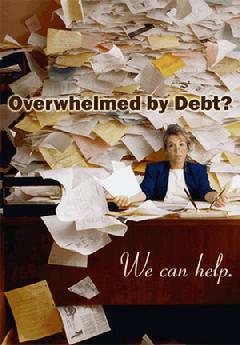 BILLS�...DEBTS...COLLECTION AGENCIES ...You can describe it in one word; you are experiencing the feeling of being "OVERWHELMED." OVERWHELMED-that-omigod-I'll-never-understand-why-this-is-happening-to-me feeling, the feeling of overwhelm can leave you feeling like a failure. This period is marked by uncertainty, anxiety, even hopelessness and apathy. You can be filled with self-doubt, bounce from emotion to emotion-anger, fear, frustration, even depression. It can shake your self-confidence in yourself, leaving you with a feeling of THIS IS MY FATE FOREVER AND FELLING OF GIVING UP OR WORSE YET�LEADING TO MORE SPENDING! I am here to tell you that overwhelm may feel like hell, but this period has its purpose. What you may not know during this period of confusion and feeling overwhelmed is that tremendous progress is actually occurring. Think about that cartoon character the coyote in the roadrunner cartoon. That poor coyote in his attempt to out-beat the roadrunner went through period one after another of being hurt and crushed. Do you remember the scene when in chasing the roadrunner, he finds himself over the ledge of a mountain and he is hanging in mid-air ready to fall to what appears to his death. That look on his face you could describe as being "OVERWHELMED" with tremendous fear. Of course, the cartoon over-exaggerates that scene and leaves him hanging in mid-air as if his life is in pause and not going anywhere. The pause is when you become OVERWHELMED in life and you stop. The pause is a period where the rest of your emotions catch up to the place where you are. It is not a bad time in your life; it is a healthy part of the progress in your life. It gives you time to catch your breath, recharge your batteries, digest what you have learned from the fatal experience you are going through. It prevents you from taking imprudent actions, making impetuous choices, or pursuing goals before you have the capacity to achieve them. If you have a tendency to make impulsive decisions periodically, you need to force yourself to go slow, use restraint, and make good decisions. This time, being in pause with our life to a hero's journey, it is the time in the wilderness, exploring the unknown. OVERWHELM marks the time between, the gap between what was and what will be. This is where your old assumptions start to disintegrate; outdated beliefs collide with new expectations. OVERWHELM is an empty space where chaos thrives. Chaos is not just senseless turmoil. The birthplace for all beginnings, the darkness from which all creation springs. Think of that cartoon character again the coyote, he never gives up, he is certain the next attempt to beat that roadrunner will work. If you keep plugging away at working towards your goal and not quit, you will find a solution to the problem and learn something in the process. You have to learn to be a fighter in life, just like that coyote that seems to be indestructible. Sure, you will go through feelings of defeat and feel depressed, but keep getting back in there and work away at it so life can teach you what you need to learn. If you try to impose your own order, to control that which feels uncontrollable, to make sense of things that does not make sense. Either you strive harder, keep floundering, feel stupid, and stop trying, or you may go back to the way you have always done things. Not surprising, you will create the same outcome as before. This is the time to look at your life and make changes for the better. This approach calls for persistence, patience, and consistency. Therefore, my advice to you my friend is to keep plugging away with your life until you find the right solutions for you. Do not ever give up! Be a fighter! For I care for you my friend, I have experienced in my life that same feeling of being overwhelmed and I have come through it. I know you will too. There�s no rule that says you have to be a superhero in dealing with the stress of bills, and being deep in debt. I can imagine you have even been losing sleep over it and being over tired is just adding to the problem. One of the first things I'd recommend is to get more sleep. If you don't get to bed until say 3am and are up by 7 or 8am to get back to working on the debt problem, you're probably only getting four or five hours of sleep a night. Most people need much more than that to function effectively. Sleep deprivation will increase irritability and mood disturbance and interfere with one's ability to think clearly. (Poor eating habits during stressful periods can also contribute to physical and emotional exhaustion.) Focus on taking care of yourself and it will help for you to think clearly, logically and critically to iron out your debt problems.